Serious MIJ Vintage Strat Clone! Bacchus is one of those MIJ lines like Tokai who cross the line on clone models but don't care. And that's why you don't be seeing no US dealers for these lines unless they're in the back of a barber shop. This Bacchus listing is a nice used model in the Seattle area-- illegal immigrant! The BST62V is a very very faithful 62 Fender Strat reproduction. They call this color "Original Metallic Turquoise", which has a Sherwood Green flavor at least to me. 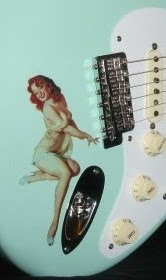 Chunky "C" neck and creamy pickup covers on a mint pickguard. All ya needs is an F spaghetti headstock decal from Lou around the corner. You be all set Jim! Do your homework on Bacchus. People seem to dig 'em! Also check out the Tokai link above for an interesting SRV story! CURRENT LISTINGS - Top Sellers - MIJ links too!